Nothing beats a blazing fire when the cold, crisp weather sets in. 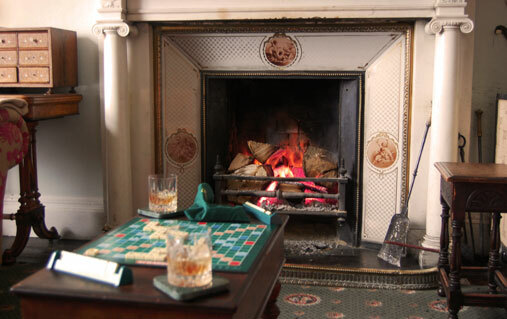 Here are six cosy firesides in Ireland to snuggle up to. Overlooking the rugged peaks of Croagh Patrick and the beautiful Clew Bay, Knockranny House’s plush interiors, antique furniture and open log fires are a cosy welcome after a bracing walk. There’s a roaring fireplace in the lobby, but we recommend you get snug in the oak-panelled Brehon Bar, and enjoy a cosy afternoon tea beside a crackling fire. Nestled in the rugged landscape of Connemara on a 450-acre estate overlooking the Owenmore River, Ballynahinch Castle’s elegant countryside decor boasts antique furnishings and roaring wood-burning fireplaces. The huge stone fireplace in the foyer is perfect for sinking into a plush seat, hands firmly wrapped around a hot mug of cocoa. 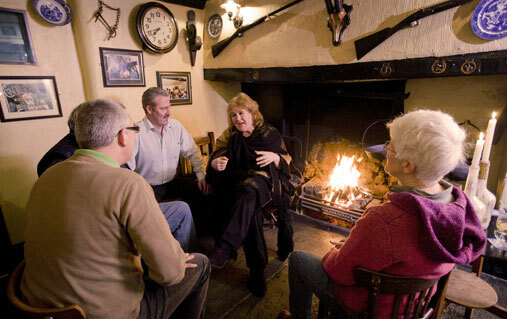 Come dinnertime, the Fisherman’s Pub’s log fire casts a warm orange glow on quirky angling memorabilia. The Crosskeys Inn dates back to 1654, making it one of the oldest thatched pubs on the island of Ireland. Its low ceilings and whitewashed walls make this beautifully antique space a cosy den to hunker down from the cold. Not content with being one of the oldest pubs, the Crosskeys Inn is often regarded as one of the best music pubs on the island. 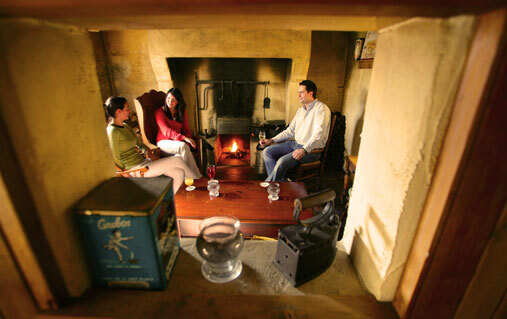 Toast your toes by the large open fireplace during a traditional Irish music session on the weekend. Staying in a lightkeeper’s house tops our list as a heavenly winter hideaway. Next door is Blackhead lighthouse, whose light once guided some of the most famous ships Belfast ever built, among them the Titanic. 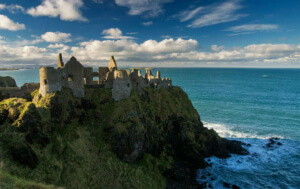 Perched on the edge of a cliff at Blackhead, the good news is that this Irish Landmark-managed property is available to rent as self-catering accommodation. 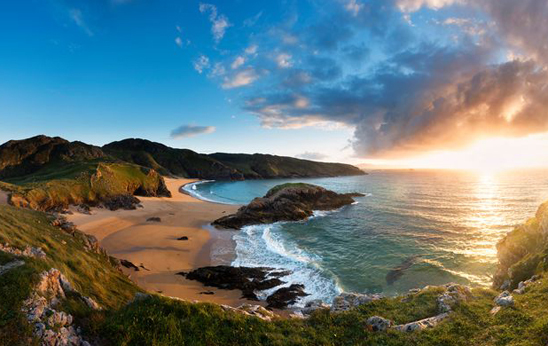 Stunning seascapes are best enjoyed with a soundtrack of a crackling fire on a stormy winter’s evening. You can expect a welcome as warm as the fire at the Georgian-style Temple House, run by Roderick and Helena Percevel. The house, which has been in the Perceval family since 1655, enjoys a sublime setting overlooking Temple House Lake and the 13th century Knights Templar castle. Enjoy tea and hot, buttered scones by a blazing fire in the morning room, or a delicious dinner in the dining room by the homey hearth.